As we discuss off and on over the years, the relationship between stocks and bonds is always complicated. 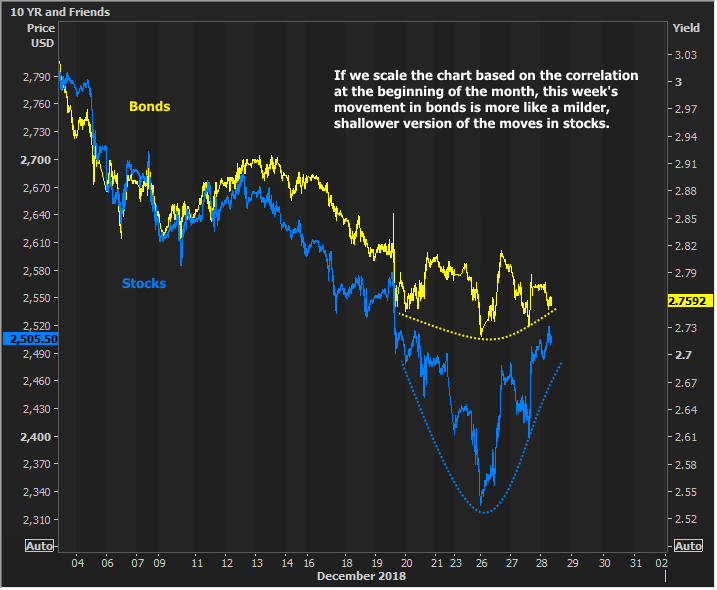 At times, it seems as if bond yields and stocks prices are following each other in lock-step. That's been true of most of the big moves in the 4th quarter of 2018, but there have still been noticeable divergences. Those divergences give us clue as to which side of the market is holding the better cards. As is often the case when looking for such divergences, it's often simply a matter of finding the right time windows to compare. For example the interesting pattern seen over the past 3 days could get lost in the shuffle if you zoomed out too far, or in too close. The chart below is just right. It shows the strong correlation from earlier in the week followed by a clear divergence. So does this mean bonds yields are outperforming? Are bonds willing to hold their ground better than expected given the bounce back in stocks? There are a few ways to answer this, but I'll start with another chart. This one changes the vantage point and gives us a completely different conclusion. In this case, it simply seems that stocks have been super volatile and bonds have merely been mimicking the movement on a much smaller scale. I'm inclined to view this week's stock losses as grossly exacerbated by year-end liquidity and government shutdown reactions playing out against the backdrop of an already-bad selling spree. Perfect little storm for stocks... I'm not surprised bonds didn't want to chase that drama earlier this week. The bounce back in stocks hasn't yet reached the point of suggesting panic selling in bonds, but I do think that line in the sand exists somewhere overhead. 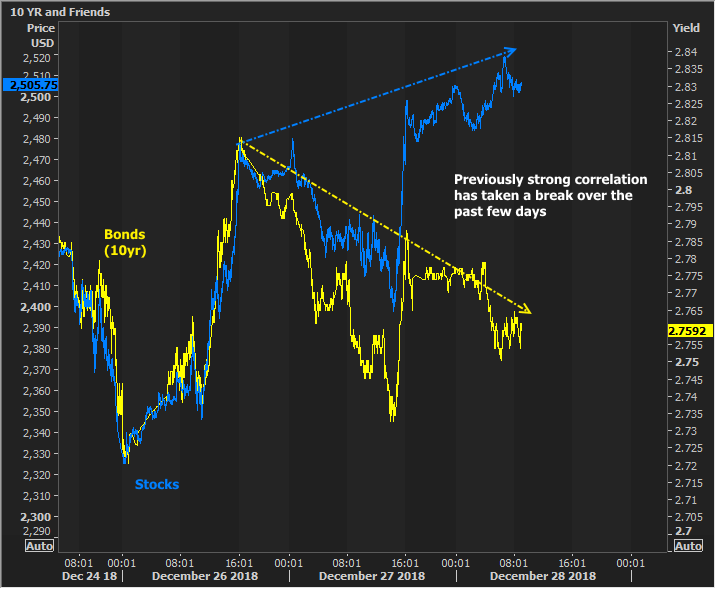 Whether bonds are willing to play that game before 2019 gets underway is another matter. That's why we're resigned to watching and waiting for another few days--still expecting the next wave of momentum to unfold no earlier than the 2nd half of next week.